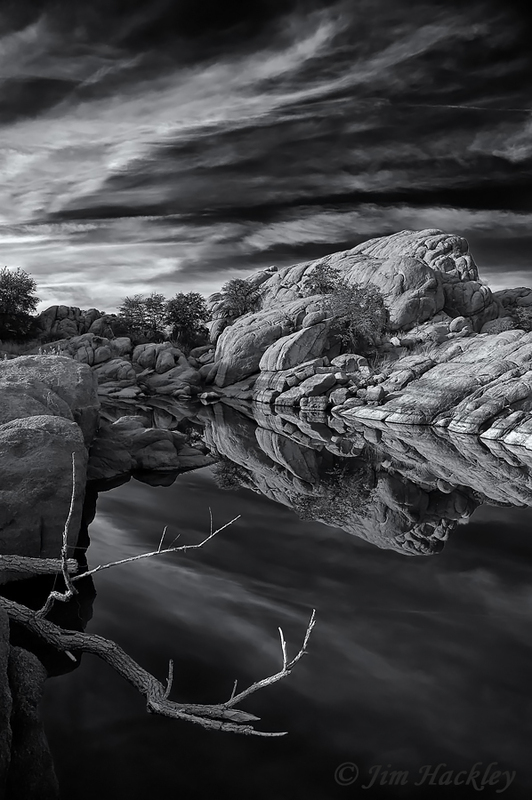 The Granite Dells area is a geological feature of exposed granite bedrock that is 1.4 billion years old. 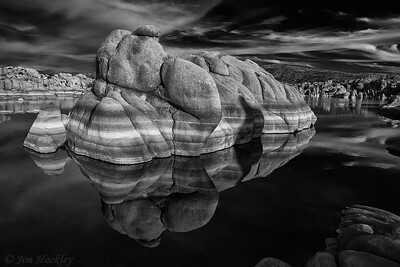 Within these granite formations two lakes were created: Watson Lake and Willow Lake. 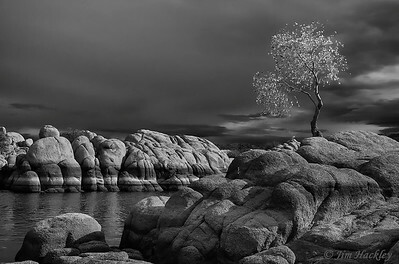 These lakes create a unique landscape environment with the combination of sculptured granite and water. Each lake has it's different characteristic's but both of these areas are a wonderful place to hike and photograph. I was hiking around Watson Lake and realized I had about 10-15 minutes before the rain (and later hail) got to my area so I hiked down to a favorite cove for some last pictures. 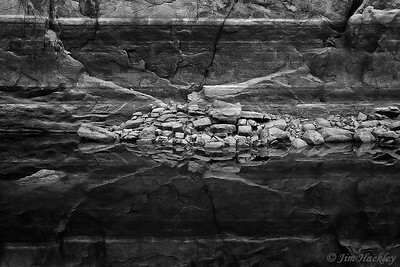 Scrambling around the granite rocks I positioned myself just above the cove, setup my composition and clicked off about 5 shots. I decided to do a quick image review to check things out and when I got to the last image I noticed a bright spot in the upper right corner of that image. To my surprise I found that I had caught a lighting strike just as I pressed the shutter button on the last image. What are the odds for that? 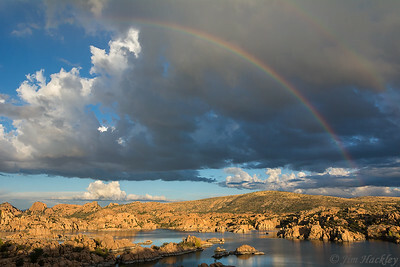 A summer monsoon storm brings dark clouds over Watson Lake but sun light always finds a way to shine through. 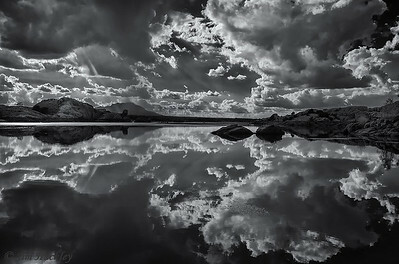 A wonderful cloud filled day hiking around Watson Lake. A wonderful calm afternoon exploring some coves along Watson Lake. 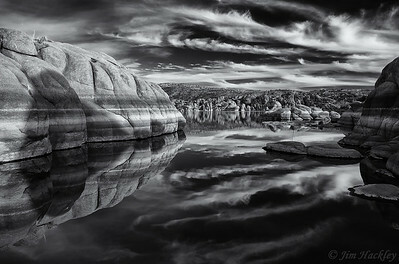 A calm day allows for some of the granite formations to really shine in the afternoon sunlight along Watson Lake. A wonderful calm afternoon along Watson Lake. 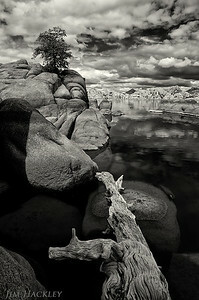 A break in the clouds during an afternoon storm over Watson Lake brings some wonderful light into this small cove. A wonderful calm afternoon hiking around Watson Lake. 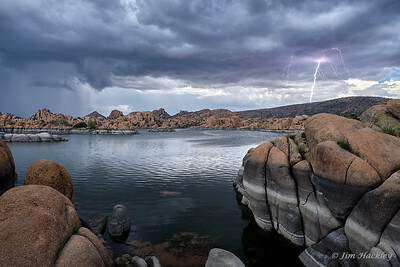 A brief display of sunlight illuminates the granite boulders during a afternoon storm over Watson Lake. The summer rains filled many a dry cove along Willow Lake. A couple of Canadian Geese came paddling by and stopped off at this partially submerged rock for a nice photo opportunity. A wonderful calm afternoon hiking around Willow Lake.